When the global community enacted the Sustainable Development Goals in 2015, world leaders also called for a data revolution. As it pertains to Goal 1, no poverty, this revolution depends on two basic questions: How many people are currently living in extreme poverty (defined as below $1.90 per person per day)? Is the world on track to end extreme poverty by 2030? We launched the World Poverty Clock in May 2017 to answer these two questions. The aim was to create a tool to track Goal 1 in real time, using statistical modeling to go from measured, historical data points to estimates for today and forecasts into the future. This seemingly simple tool does many things: It estimates the number of people living in poverty; calculates the speed of progress (or the lack thereof); and projects each country’s position until 2030. This “big data” undertaking uses several different datasets to get “best guess” estimates. We want people to look forward when discussing poverty reduction and avoid becoming trapped into discussing past results. We want people to think about development dynamically. This is why we developed the concept of a poverty escape rate, which measures changes in poverty every second, hour, or day. Comparing targets for 2030 with actual current experience allows us to categorize countries based on the likelihood of achieving Goal 1 into three categories: on track, off track, or wrong track. With the latest updates of the International Monetary Fund’s World Economic Outlook and an additional 100 surveys from developing countries, the World Poverty Clock can now make new projections for 2017 and beyond. The good news is that global poverty reduction will remain strong in 2017. The world is expected to reduce extreme poverty by 38 million people, slightly faster than in 2016 when an estimated 34 million escaped poverty. 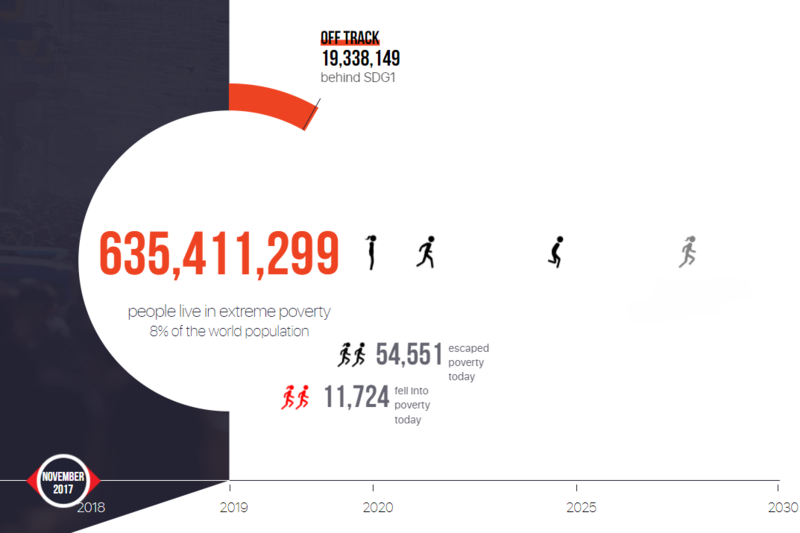 The bad news is that this is not fast enough to end poverty by 2030. To end poverty, 1.5 people need to escape poverty each second (or 90 per minute). The average rate of poverty reduction in 2017 is 1.2 people per second. This means that at this point the global reduction in poverty is falling short by 9.5 million people compared with the speed needed to get to zero poverty by 2030. In countries where poverty is falling, about 47 million people will escape poverty in 2017, but poverty is actually rising in 30 countries. In these countries, an estimated 9 million will fall into poverty in 2017. These “wrong track” countries, therefore, account for the shortfall in the global target. Asia is reducing poverty at a considerable speed. Asia’s poverty escape rate in 2017 is 77 people per minute, while the rest of the world is adding poor people. The greatest regional challenge is in Africa, which would need to reduce poverty by 57 people per minute (almost as fast as Asia is doing now) to reach its goal. Unfortunately, Africa is moving in the wrong direction, adding 2.4 million more poor people during 2017, or 4.6 people per minute (see figure). More Africans are living in poverty mainly because two of the most populous African countries—Nigeria and the Democratic Republic of Congo—are falling behind, adding 9.3 poor people every minute (Nigeria -5.7; DRC -3.6). The rest of Africa is reducing poverty slightly above 4.7 people per minute, which still produces a negative balance for the whole continent. Based on current projections, the world will not end poverty by 2030. Poverty will likely be lower by about 200 million people, but 438 million people, or 5 percent of the world’s population, will still live in extreme poverty. This is because there is a high likelihood that the pace of poverty reduction will slow down markedly in the coming years. In 2022, our model predicts that only 16 million people will escape poverty, less than half the current rate. The slowing down of poverty reduction is mainly due to Asia, which will be getting close to ending extreme poverty, while many parts of Africa are not making sufficient progress. Poverty rates in Africa will go down from 34 percent in 2017 to 23 percent in 2030; however, due to population growth, poverty will only decline slightly in absolute numbers. If there are no dramatic short-term changes in Nigeria and the Democratic Republic of Congo, Africa will continue to see increases in the absolute number of poor people for the next five years. That all being said, it is important to remember that these are forecasts. Actual outcomes may be different, either because the underlying data are adjusted, or because actual incomes rise less or more. However, if we use the latest available datasets and apply the best forecasting methods, we can predict that under a base-case scenario the speed of global poverty reduction will slow down markedly three years from now.